Posted on August 4, 2009 by admin. 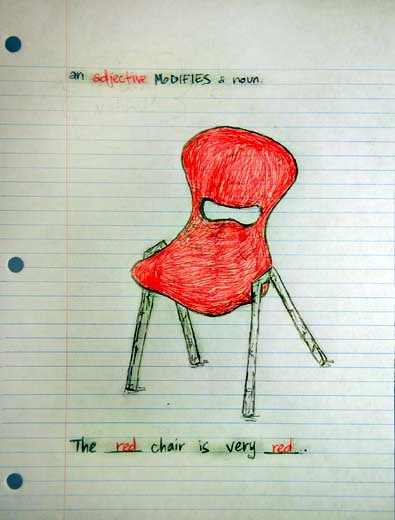 This entry was posted in Paintings and Drawings, Uncategorized and tagged adjective, chair, grammar, illustration friday, modify, red. Bookmark the permalink. Great concept and school house rocks link! Wonderful illustration! I intended to send aonyne the amount of note just to give thanks once again in connection with superb suggestions you have shown in this case. This is really seriously generous with people just like you giving freely what the majority of us could possess sold as a possible ebook to get rid of up making some coinage by themselves, chiefly since you may have completed it in case you decided. These tactics likewise served such as the fantastic solution to understand in which other individuals possess a similar dreams the same as my very own to know a whole lot more with regards for this problem. I believe there are numerous more pleasurable periods beforehand for those who have a look at your website.